The trend in baseball around power bullpens isn't new. But here in 2018, this seismic shift has become as conspicuously apparent as ever. If the Minnesota Twins want to establish themselves as true championship contenders, it's blindingly clear they need to stockpile some serious late-inning juice. While the club appears to have a decent foundation in place, much work remains on this front. In the American League Wild Card Game last week, New York received four strong innings from starter Luis Severino before unleashing its intimidating reliever stable on Oakland's doomed lineup. Dellin Betances, David Robertson, Zach Britton, Aroldis Chapman... ballgame. The Twins can relate. One year earlier they'd been bounced in the same ballpark, after a bottomless Yankees bullpen ate their lunch following Severino's first-inning exit. Of course, the A's had made it into this position on the strength of their own stellar pen, which carried them to stunning regular-season success and made up for a wholly unspectacular rotation. Look around at the rest of the remaining teams, and you'll find plenty of deep, dominant relief units. Which brings us to the Twins. They finished the season with exactly two reliable relievers. The good news is that those two – Taylor Rogers and Trevor May – had a hell of showing in 2018, solidifying themselves as fixtures. Rogers has fully graduated to top-tier status, having finished with a 2.63 ERA and 0.95 WHIP after closing his year with 28 straight scoreless appearances. His 2.33 FIP ranked ninth among MLB relievers, and fourth among those who made 70+ appearances. Once a lefty specialist (and a great one at that), Rogers is now an all-purpose shutdown arm and easily Minnesota's best bullpen asset. May shows signs of being able to join him at this level of distinction. He was nothing short of spectacular in his return from Tommy John surgery, turning in a ridiculous 36-to-5 K/BB ratio in 25 innings. Take out his disastrous lone outing as "opener" (1 IP, 4 ER) and the right-hander put up a 1.73 ERA, 0.90 WHIP and 13.3 K/9 after joining the team in late July following Tommy John rehab. He averaged a career-high 94.1 MPH with his fastball, pounded the strike zone, and induced a 15.4% swinging strike rate, which would've ranked among the top 10 AL qualifiers. May finished the year as closer and looked very much up to the task. Rogers and May are 27 and 29, respectively. Both remain under control for multiple years. So, that's the good news. Elsewhere? Plenty of not-so-good news and uncertainty. I'm not sure you can make a strong argument that any other incumbents are locked into the 2019 bullpen. Addison Reed is probably closest, solely by virtue of his contract. He's owed $8.5 million next year as part of the two-year pact signed in January, so he'll get every opportunity next spring, but Reed showed nothing to indicate he's capable of being any kind of positive contributor. His 4.50 ERA was bad and his 5.11 FIP was worse. His fastball velocity was way down. He missed three weeks in July with elbow soreness and came back looking even worse, allowing an .842 OPS with just 8% swinging strikes the rest of the way (in 2017 he was at 13.7%). It's very obvious that Reed's arm was not close to 100% for the majority of the year, but evidently Minnesota never discovered structural damage and so no action was taken. The Twins have little choice but to hope several months of rest will cure what ails him. Trevor Hildenberger, too, looked completely broken by season's end. The reigning top Twins reliever bounced back from a rocky spring and put together a solid first half, but collapsed in the second. In August and September, he allowed more than a run per inning (9.55 ERA) and a .965 OPS, fumbling away his audition in the closer role. Much like Reed, the Twins were hoping Hildy would be a trustworthy staple, and now he's probably going to have to earn a job next spring. His greatest strengths disappeared, as his ground ball rate dropped from 58.8% in 2017 to 46.3% in 2018, as his K/9 rate dropped from 26% to 22%. 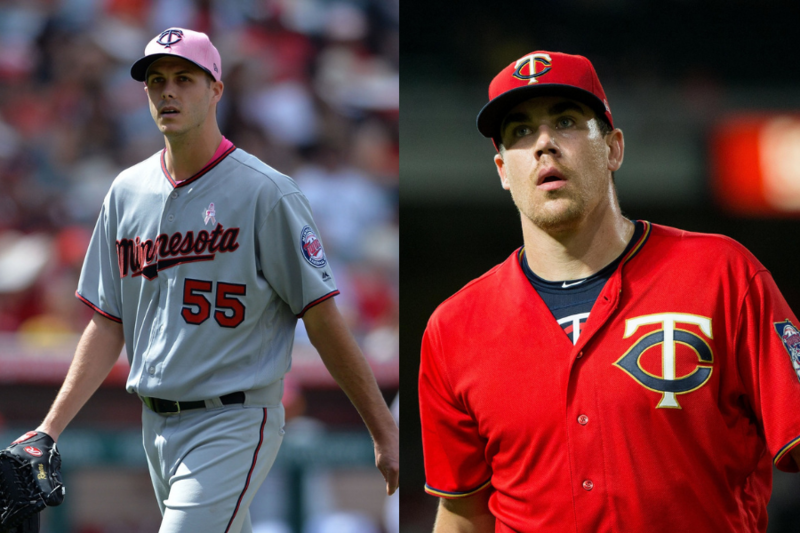 The unraveling of these clearly capable righties throws a wrench into Minnesota's bullpen planning, and also casts further scrutiny on the decision to trade Ryan Pressly, who has since cemented his rep as one of baseball's very best relief pitchers. Jorge Alcala had better pan out. In the meantime, the Twins need to replace Pressly's impact in the bullpen if they have true aspirations for 2019. The remaining holdover candidates – Oliver Drake, Matt Magill, Alan Busenitz, Tyler Duffey, etc. – should all be considered fringe contenders for the bottom spots in the bullpen. This means Rogers and May are short on company at the top. General manager Thad Levine, fresh off turning down the Mets' advances, will have his work cut out for him. Last winter he showed some savvy in signing Fernando Rodney and Zach Duke, but his biggest splash (Reed) proved to be his biggest whiff. Will Levine be gun-shy this time around, still on the hook with Reed as the largest current payroll commitment for 2019? There are other options than free agency, of course. Trades are in play, and in fact I would wager good money the Twins acquire at least one reliever through this avenue during the winter. Meanwhile, any number of borderline starter candidates could be converted to relief. It's an approach we've seen work with May among many others. Zack Littell, Kohl Stewart, Fernando Romero or Lewis Thorpe could be intriguing in this regard. Needless to say, there's a lot at play here. We'll lay it all out for you – free agent options (+ what they'll cost), realistic trade targets, and an in-depth feature on the closer situation – in the 2019 Offseason Handbook. Preorder it today and you'll get your copy ahead of the official release. Pony up for Britton, let Reed/May/Hildy/Rogers be the setup guys. Agree we need to pony up for one of the top relievers, not sure it is Britton I want.There are several though, so Twins have choices. True Championship contenders? I like your optimism but that is one heck of a leap for a team that has mostly been playing sub 500 ball for a long long time. So, I think everyone will agree the front office needs to find an impact arm for the bullpen one way or another from outside the organization. If they want to have a successful several seasons ahead though, they really need to find some gold either from the Busenitz/Duffey group, from the minors, or from the recent starter promotions who don’t end up in the rotation. My personal belief is that Falve rose to the top when he was hired based on the belief that he could recreate what Cleveland was able to accomplish creating a strong pitching program within budgetary constraints, something he was publicly given a lot of credit for. He has had time to put people in place through out the minor league system, rebuilt the major league coaching staff, soon with a new manager, and has an unprecedented amount of sallery flexibility this offseason. It’s time for him to give the fans some payoff. Admittedly we did see a much improved rotation this year, but I want a whole pitching staff that’s good, and a manager that doesn’t burn out his favorite bullpen arms. Note that the Cleveland Indians are the team that gave our front office their reputation. Take away Andrew Miller in the Indians have one of the worst bullpens in the playoffs. I'm not sure why we expect this leadership to do any better with ours. In a recent article in the athletic they showed a number of charts related to bullpens and you can guess where we are. I'm not entirely sold on the idea of signing more free agents to re-stock the bullpen. Sure, another new arm or two would be nice, but there are no guarantees. Look at what Colorado did last winter, signing some top name relievers, only to have most of those guys put up horrible numbers. Granted, they ended up going to the playoffs, but those big signings were not much help. Yes, they have a need for at least four top relievers if they are going to make a run.Yes, they have only two on the current staff...but they do have two.And yes, this was an excellent article, thanks Nick. I don't understand why none of all the many relievers spending time at Rochester last year did anything.Please Lord, give us just one good arm out of that group.And no, I do not want it to be Thorpe.He is our next ACE. As for actual solutions, I am not going to speculate.That's way beyond my pay grade. Kimbrel for the closer job, Britton for the LHSU job, May for the RHSU, Rogers as a loogy and the rest will fall into place. The Twins can afford it. How about signing "Speedy". Relief is just a swallow away. They need 3 bullpen signings, and at least 1 has to be a dominant arm. I would look to upgrade every "fringe" arm the Twins have. If there's any 40 man crunch problems, the first people I'd cut from the roster is Duffey, Busenitz, Curtiss, and Drake. Some of you need to chill out! The biggest pitching issue for the Twins is lack of number one and two starters. Look at the Indians, Red Sox, Astros, and Yankees for comparison. Berrios is a number four on those teams. Their inability to develop top starters is the biggest problem. Teams with excellent starters don’t need relievers to start a game and pitch an inning or two. That’s a gimmick that says our starters aren’t good enough, IMO. I imagine Kimbrel's price tag is going to be shockingly high.I'd go down to the next level and offer Britton a contract and try to get him while the sharks are circling the bigger fish. Of the payroll room we have, I'd rather spend the bulk of it on the offense than the bullpen. We need pitching, pitching and more pitching. Nick is right, we have exactly 2 solid relievers and that assumes they don't get hurt, regress, etc. We can fill spots 6, 7 and 8 in the BP (with our starting staff we will need 8 relievers again) from the various guys we have. I vote for Reed, Magill and Hidenberger and I'm squeamish about all three. That leaves us short at least 3 BP arms, one of which has to be a high leverage/closer type. We also need 1 or 2 starters, 1 if we actually get a top of the rotation guy like Patrick Corbin, 2 if they are more middle of the road types like what we always seem to sign. This is the key off season challenge. Yes, we need a SS and could use a power bat but the pitching has to take priority. We don't have enough with the young guys. We need help from the outside. This year's free agent class of relievers might be unprecedented. Also unprecedented: the Twins available payroll. If they can't get two or three excellent-to-elite BP arms then they're not trying hard enough. Buy the relievers, trade for the other areas of need. This team can afford even the priciest reliever, if they try to do similarly with starting pitchers or elite bats they have to settle for 3rd tier guys. This year's free agent class of relievers might be unprecedented. Also unprecedented: the Twins available payroll. If they can't get a two or three excellent-to-elite BP arms then they're not trying hard enough. Buy the relievers, trade for the other areas of need. Concur. There are a baker's dozen quantity of intriguing bullpen arms available this offseason. No excuse not to sign 3 of them. And I think a dozen is short-changing it. I think the class could be 20 deep. I just don't want to sit back this offseason and wait for the "bargains". They need to go get the guys they want, they'll never be able to spend all their free agent money anyway. Let another team celebrate getting "bargains" in February, if no one else is offering them perceived market value, there's likely a good reason for it. Pay for the strikeouts, pay of the velocity pay for the plus control, don't skimp and see who's still around when the dust clears. The "bargain" guy can be the third addition. Maybe. They could do trade deadline deals. That's how Houston got Pressly from us. This. 100%. The Twins going into the offseason have so much payroll flexibility that there is zero reason not to spend money on the bullpen to improve it. I'd like to see one of the top bullpen pitchers signed and then at least one more quality bullpen pitcher signed. Make the moves necessary to improve this team so the manager doesn't have to rely on one or two pitchers who then get overused by midseason. Step 1 would be to get into Houston's position next July then. Only teams in first place can make trades for MLBers? Huh! Learn something every day! Well the Twins could have traded for a Pressly-type bullpen arm in July too but they didn't because the team was so far in the hole that there wasn't much point to it. Making a good team before the season starts will win you more games than making a good team in the middle of the season.